I did mean it when I said we will fwd this complaint to our LPs!! The thing is, unlike most of other brokers, we do send all the orders to the market and charge the swap rates we are charged. One key point witch public may not catch is that Darwinex dont charge a mark up ! On the other hand, I think that special period about end of year + crisis at the same time need the LP to cover some additional risks. This special time need explanations to people. Swap in not only about money * time, there is also a part about risk. 44.4$ / lot long EURUSD equal 4.44 pips swap / day! In euro a short eurusd pays 0.04euro a day per microlot. so 1 short microlot pays 0.06 euro a day. Per microlot short position this adds up to 7.30 euro a year. I have around 60 short positions open. Having them at activetrades instead of here makes a difference of 60 * 7.30 = 438 euro per year. There is not a single pair over here that cant be found better at another broker. Most other brokers also do not charge commission. When trading nzdjpy, usdchf, nzdchf, gbpchf, eurgbp, usdsek and a few more like this the difference in swap adds up to may thousands a year. Do the math yourselves and choose another broker if you want better conditions. Rollover changes that are a bit weird? I like to do some carry trading as well and need steady swap for that. Darwinex never had fixed or favorable swaps, it is not a broker for carry traders. They just resell LMAX liquitidy. Spreads + Commissions though, I haven't seen anyone else with such low spreads + commission as Darwinex. For those that engage in short term trading, this is most excellent. I like darwinex because they are honest and I can manage an aum. May I suggest you to record the spreads and compare Darwinex with other brokers? I´m pretty sure that with the money you are paying on mark-ups to other brokers you can go to a nice place this summer for holidays. Instead I think it's more simple for you to show us the spreads of other brokers, isn't it? I am a trader not a brokerologist. My goal is to beat the market not to review brokers. As far as I know spreads are competitive, maybe swaps aren't but i haven't done a real research. I trust darwinex and even if swaps are not so cheap i think this is the best they can do for a real DMA trading. If I understood previous posts correctly (the one where rebates are explained), Darwinex's revenue stream is composed of only commissions paid for trades - $5 for roundtrip lot, iirc. Now, darwinex can claim roughly 40% of this, the rest goes to liquidity providers and whatnot. Then, they decided to provide rebates for diversification? WHAT THE F? This still boggles my mind. They absolutely did not have to do that AT ALL. But they chose to do it, because they want investors to be successful, thus encourage diversification even if it eats at their profits. This alone was enough to make me "trust" Darwinex. I believe they are doing the best they can, given their size and means. Exact investors are rebated by ~25% and providers are rebated by 40% with a darwin that has dscore 60. And now there is no swap at all for nzdjpy. mt4 Displays 0 for both long and short? What on earth is going on here? As I said before @MrDarwinnn can publish here the swaps of his 7 other accounts so we can compare. 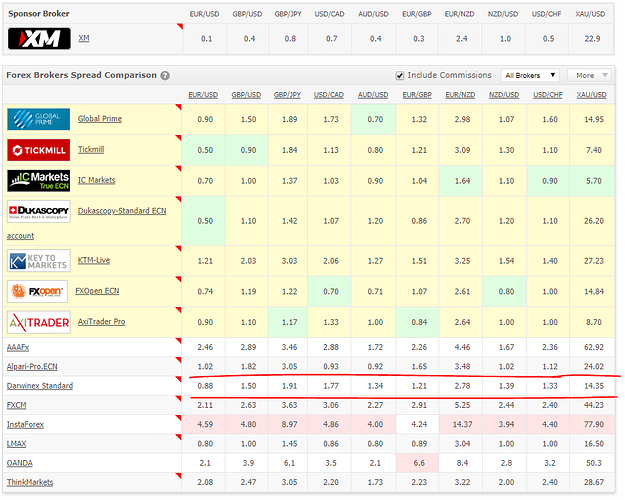 spreads and compare Darwinex with other brokers? yes Darwinex is very competitive. Have used about 8 brokers myself. It is not only some end-of-year abnormity. It happens throughout the year. I can compare the swap rates only with ICM, and ICM is far better and more stable (both in swaps you get or pay). see what, spread? Swap was the issue. Displayed spread is for brokers charging same turnaround fee? In case not there is nothing to compare.